Over the last three months I have been trying out a few items from Smartwool's new season range. You may remember Backcountry Skiing Canada's previous review on Smartwool where I explored the question why wool? I will save the sentimental story on how I grew up on a merino sheep farm for now but I will give a quick overview on the science of wool and why it works. The protein (Keratin) that wool is made of is able to shed small quantities of moisture from it's surface with ease, so wool is great for moving moisture. Both synthetics and wool have the ability to wick moisture but only wool can wick away moisture in it's vapour state. Thanks to this moisture management, odour-causing bacteria don't have a moist environment to thrive in, so no more stench in the car or tent at the end of a day of hiking. This is hard to make sense of unless you look at what happens on a molecular level. 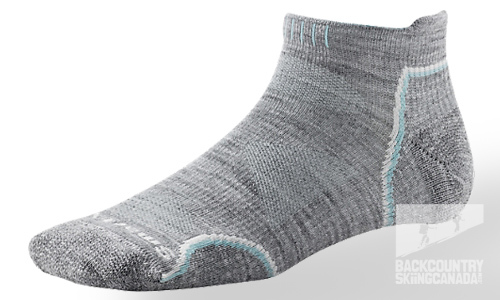 Smartwool has a great description on how this works on their website under 'discover'. Basically as wool absorbs moisture from your body energy is released in the form of heat, conversely as wool releases moisture to a drier environment it creates a natural cooling effect. Made up of interlocking protein molecules kind of like our hair and skin, individual wool fibres can be bent, stretched or flexed in any direction tens of thousands of times without damage. On top of that wool fibres have a natural crimp which improves elasticity and resilience. We're talking about Merino wool here. The reputation wool has for being itchy harks back to the old days of heavy wool fibres. The "itchiness" of the wool is determined by the diameter of the fibres used. Larger diameter means less flexibility and bend so the fibres become prickly. Merino wool easily overcomes this as it's fibres are so fine that they flex and bend when they are pressed against the skin. Smartwool only uses the finest Merino Wool available accredited by Zque, an accreditation program that ensures environmental, social and economic sustainability for growers as well as animal welfare. Smartwool take this wool and puts it through a 'smart wash' which essentially smooths the scales of the fibres prior to spinning, resulting in an easy care fibre and no shrinking when you wash. Smartwool then focuses on making the most of this quality yarn through innovations in fabric creation. This is followed through with a thorough understanding of how to fit and design for the human body, its diversity and its activities. 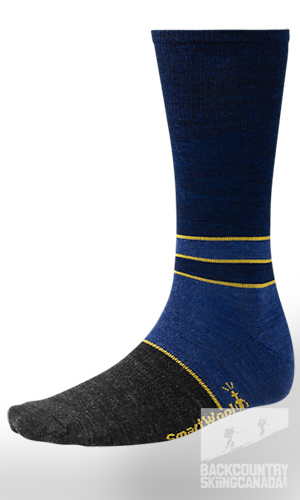 Smartwool is designed for performance but can work just as well downtown. We've taken a look at a few items that favour performance and a few that favour everyday style. 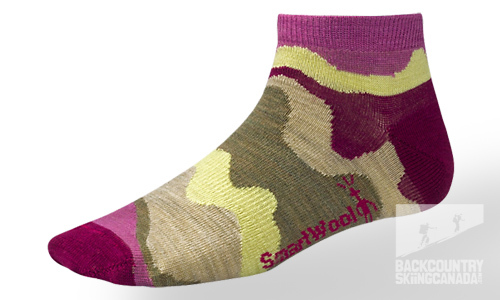 Recently Smartwool released the Smartwool Trail Apparel Collection. Designed for comfort and performance the pieces have an active fit with technical features. These items fit into Smartwool's SportStyle collection - coined as performance by nature, stylish by design. They're designed to look at home around town but keep up if you take 'em on a hike. They have a comfortable fit with stylized features. I have been sold on the qualities of wool since I was a kid when it meant we had food on the table. Now I understand it's a sustainable and renewable resource, it can keep you warm and keep you cool, it helps keep you smelling fresh, it lasts (if you take care of it) and—if it's Merino wool—it's soft and super comfortable. After the synthetic revolution of the 90's it's great to see it come back as an optimum solution for performance apparel. This is my first folly with the more lifestyle oriented clothing from Smartwool. 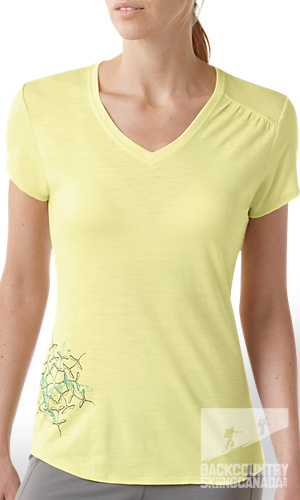 I found the Short Sleeve Flight V-Neck Tee highly versatile (and pretty). I have worn it around the city and then a number of times hiking. It's super light and comfortable and feels feminine thanks to details such as the shirring on the left shoulder. Even though the piece is less technical it still goes the mile. Another example of going the mile is how my partner tried the Color Block Denim Socks in his ski boots for a quick tour and loved them even though they are designed more for around town. The Lifestyle oriented apparel looks good and is very comfortable but if you are looking for stuff that will perform with strenuous exercise or that you could wear for days I would recommend anything from the performance oriented collection. It's hard to fault this stuff when you are out in the mountains. 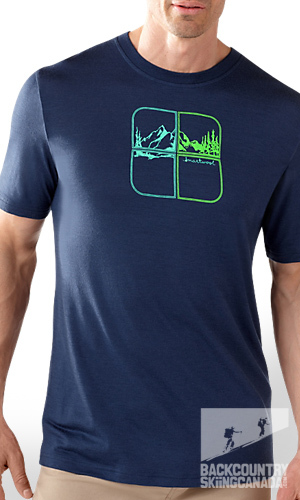 I wore Smartwool's Cortina Tech Tee on the Wapta traverse and after five days it was still as fresh as roses. It breathed beautifully even though it was spring and the days were warm. 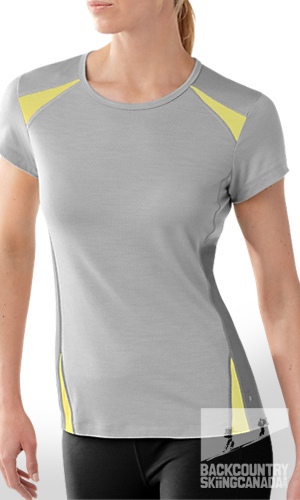 The flatlock seams reduce the bulk and the fit is comfortable and flattering. 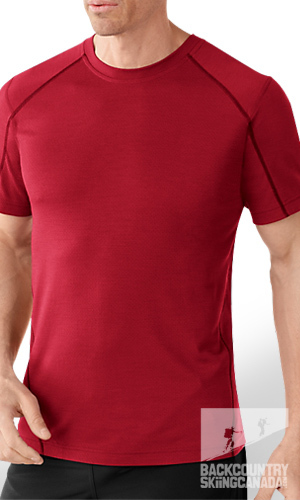 I would highly recommend the Cortina Tech Tee for ski touring. 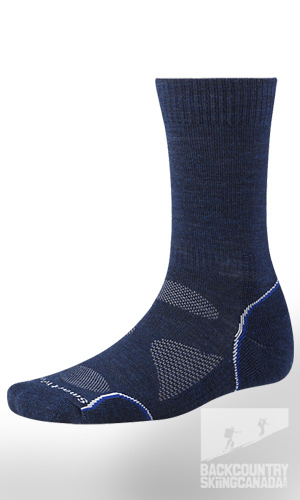 When you are on your feet all day the performance enhanced PhD Outdoor socks are definitely the most comfortable socks I own thanks to their articulation, cushioning and mesh areas that keep your feet cool. You put them on and they don't move because they have elasticized areas that act as compression bands around the foot. 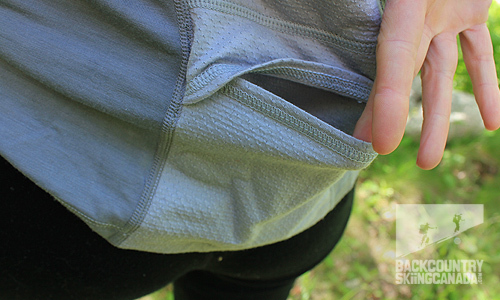 Technical features like this make Smartwool's performance wear worth every cent. Like they say - you get what you pay for. Superior quality, well-styled designs. Performance fit that enhances the naturally efficient and practical qualities of Merino wool. Shrink resistant. Made with Zque accredited Merino wool. Incredibly comfortable and durable. Feels good on the trail. Women's Tranquil Sands Socks are very pretty but they can slip off the feet easily in some shoes. Wool is not as hard-wearing as some synthetics so you will need to take a little extra care.